Here’s my Dad (in the centre) with his father Fred (on the right) and his brother Ray (on the left). The picture was taken at our townhouse on Willow Street in Hope in May 1981. We were playing cards – the hands in the lower right corner shuffle a deck of cards and the yellow pot in the centre of the table holds the money. It was probably a game like “Chase the Ace”, because I see single dimes on the table. 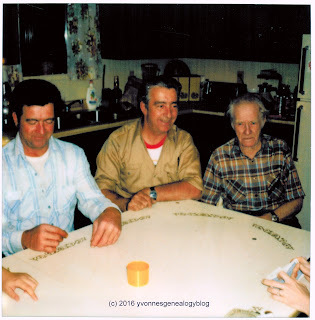 Dad, Pépère Fred, and Uncle Ray have all passed away, but time has not erased the memories of those fun, family games.